For many people, pets are a part of the family, so losing one can be an upsetting experience. In this article, we go look at the options you have when your pet passes away, as well as what insurance can pay out for if your pet dies. If you've just lost a pet and are looking for somebody to talk to, Blue Cross offers a telephone service on 0800 096 6606. What are your options if your pet dies? How much is a pet cremation or a pet funeral? Will insurance pay out if my pet dies? If your pet is ill, you should take it to a vet as soon as possible or call the vet to come and visit you and check on your pet. It's never a good idea to diagnose your pet yourself or to do nothing because it could result in your pet suffering unnecessarily. If your pet is seriously ill and there is nothing the vet can do, they may suggest putting your pet down. They can do it at their practice or even come to your home, which may be less stressful for the owner and pet. Vets do charge a fee for both services and it can cost over £100. Lots of pet insurance policies provide cover for having your pet put to sleep. Most of Bought By Many's pet insurance policies, for instance, offer £150 cover if your pet needs to be put to sleep. Other pet insurance companies have their own limits. You can get a quote from Bought By Many's pet insurance by joining our pet insurance group. What are my options when my pet dies? 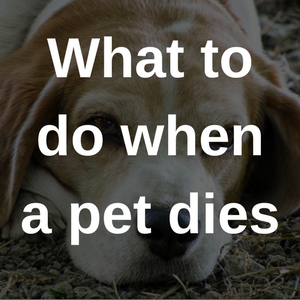 There are a few options you can take when a pet dies. There are dedicated pet funeral companies that can offer burial services or, if you prefer, cremation services. It can be comforting to host a funeral for a pet. Much the same as funerals for humans, it can provide closure and a chance to say final goodbyes. If you have children a pet funeral can be a good opportunity to explain to them what has happened to the pet. Some people prefer not to hold a ceremony when their pet dies. It can be expensive going to a dedicated pet funeral company. The vet can usually dispose of your pet's remains if needed. This is usually done through cremation, though you might not be able to get your pet's ashes afterwards. There's also the choice of hosting your own funeral. According to the law, a pet has to buried on the property in which it lived, if it isn't going to be buried in a dedicated site for 'animal waste'. This means you're within your rights to bury your pet in your garden. The exception to this rule is if the pet's body is 'hazardous'. This will be decided by your vet, though cases are rare and it is not specified what is meant by hazardous. The Citizens Advice website suggests you contact your local environmental health department to make sure they are happy with you burying in your garden. If you do go for a home burial it's important to make sure the hole is deep enough. Generally, it is recommended that the hole is at least 4 feet deep. You shouldn't bury your pet near to any water supplies. After your pet has been buried, you may want to mark the spot - for instance, you could place a stone over the site or plant a tree or flower. You can also purchase a headstone for use on your grave. How much is pet cremation or a pet funeral? Expenses for a cremation service for pets will vary depending on the animal you have and the company you go to. 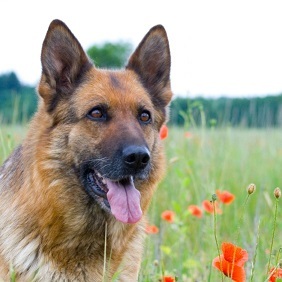 There are many UK pet funeral and cremation services, all of which will have a range of services and prices. However, most offer both burial and cremation and usually provide for different types of pet. For small pets, a service may cost less than £100, for large dogs it can cost up to £250 and for horses you could pay up to £500. On top of this, there is the price of an urn if you wish to have ashes returned, as well as a headstone or plaque to remember your pet by. Some companies even offer commemoratory trees, shrubs and benches, and have their own memorial gardens you can visit to see your pet's memorial. Companies usually offer a cheaper option of cremation if you do not wish to have any ashes returned. There is also the option of having a pet funeral, in which the body of your pet is prepared and buried. You can choose to have your pet laid in a chapel first, meaning you can come and say farewell before your pet is moved to the cemetery. The ceremony is similar to a human funeral, with a graveside service of farewell. Some pet funeral services offer advanced payment plans, meaning you can sort out the funeral or cremation and pay for it before the time comes. This can be useful as losing a pet can be a distressing time, making it hard to organise something like a funeral. Others can provide information on bereavement counsellors to you move on from the loss of your pet. What you say at your pet's funeral will depend on the type of animal your pet was and what memories you want to share. However, there are some pointers about what to say about the death of your pet. There are several Bible verses that relate to the death of a pet. Many websites list these, including Love to Know and Lynn Dove. There is also a popular poem called Rainbow Bridge that commemorates the death of pets. This may be a good choice if you have young children because the poem's themes focus on reuniting owner and pet, and may help in consoling them. You could also ask each of the people at the funeral to think of their first, or a particularly fond memory they have of the pet, and share it. Most insurance policies for pets have a limit for how much they will pay out if your pet dies. This is based on how much you paid for your pet or, if you don't know this, the average market price. If you got your pet from a rescue centre and paid a donation, death cover may be able to pay out for the donation you paid. There will also be a limit on this price, meaning you may not be able to get the full amount you paid for your pet if it was particularly expensive. Bought By Many's Complete cover, for instance, has a limit of £6,000 if your pet passes away from accident or illness. This is the highest limit on the market. We also offer £150 to cover the costs of having your pet put to sleep by a vet. Get a quote from Bought By Many by joining our pet insurance group. There are exclusions relating to death by accident or illness. Most pet insurance companies won't pay for the death of your pet due to illness if they are over a certain age, usually 9 years. Generally, however, they will pay if an older pet dies due to an accident. For exotic pets, there may be other exclusions; for instance, if your pet dies due to being attacked by vermin, you may not be covered under the death section of your policy. Usually, the money paid out when your pet dies by your pet insurance company can be spent in any way you please. It is designed to cover the cost of the pet, but you could use it to have a funeral for your pet. Find out more about Bought By Many's unique pet insurance products by joining our pet insurance group.